In the management of agricultural and environmental resources, a large number of stakeholders with distinct interests are commonly involved. Exploring improved management options for these systems, requires the involvement of these stakeholders. Companion Modelling (ComMod) is a participatory gaming and simulation approach that uses role-playing games and simulation models to tackle complex issues in the fields of renewable resources and environment management together with stakeholders. ComMod promotes dialogue, shared learning and collective decision-making, strengthening the adaptive management capacity of communities facing wicked environmental problems. A ComMod approach is iterative and evolves with the participative process whereby stakeholders are involved in the definition and design of the questions, models, simulations and outputs. It involves constant back and forth steps between the model, the field and the negotiation. 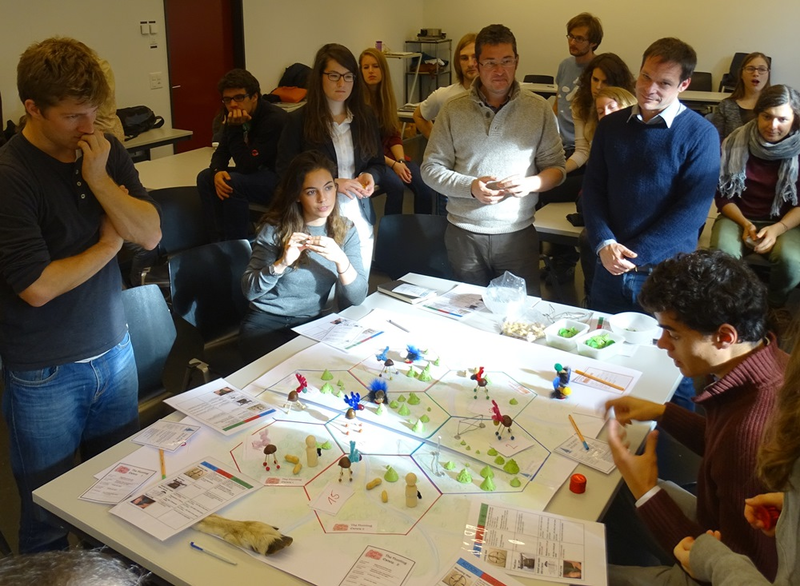 Facilitating multi-stakeholder processes using participatory gaming and simulation table. Concepts, such as: wicked problems, socio-ecological systems, complex systems, participatory modelling, simulation strategies. Methods and related tools, such as: system representation, participatory mapping, model conceptualization, agent-based modelling, role-playing games, participatory simulation and scenario assessment, brainstorming, debriefing and evaluation, facilitation and conflict management. The course is composed of a series of lectures on participatory gaming and simulation approach Companion Modelling and facilitation, introductory gaming sessions, group work on game development and crash testing one of the games developed. Participants will learn the principles of participatory gaming and simulation through the companion modelling approach and facilitation. They will experience the development of a game first hand. Lectures: During the mornings, one or two lectures will be held on the principles of companion modelling and facilitation of such a multi-stakeholder process. Hands-on experience: During the afternoons, participants will gain hands-on experience in developing, testing and debriefing games and facilitating processes. It is possible to join the course without actually spending the night at the course location. However, we emphasize that there will be evening sessions on most evenings. This course is organised in collaboration with ETH Zurich, CIRAD, and ECOSUR. Options for accommodation Accommodation is optional in this course. We can book a room for you at the venue, but you can also make your own arrangements elsewhere, or spend the nights at home. Do note that there is quite an intense evening programme, though. There are several possibilities for overnight stay in Wageningen. For information on B&B's and hotels in Wageningen please visit proefwageningen.nl. Another option is Short Stay Wageningen. Furthermore Airbnb offers several rooms in the area.